ResidentDante: Infinite shocks of a biological matter! Infinite shocks of a biological matter! There really are very few games that represent this generation better than Bioshock from 2007. It completely blew me away with it's atmosphere, amazing storyline and setting. The original team have returned and Infinite is a very similar affair, it could almost be in the same universe as Bioshock. Only this time it's about a city in the skies, rather than beneath the ocean surface. 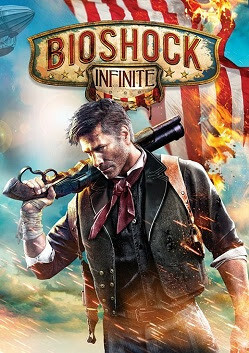 Bioshock Infinite starts with a very familiar setting for Bioshock fans and in a way it feels a lot like the hugely popular 2007 game only with a new setting and visual style. It reminds you of how fantastic the original was, and perhaps this sets an almost unfair high expectation of what Infinite should offer and captivate. 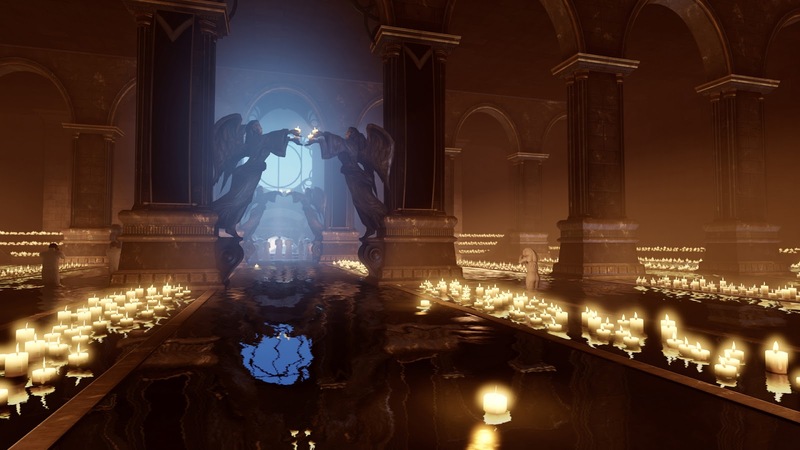 Infinite is a far brighter and more pleasant environment, compared to the dark city of Rapture in flooded tunnels at the bottom of the sea. It does, however, contain a dark story and while not being maybe as scary as it's ocean based predecessor it tells a fascinating story of an utopian dream of a city that is constantly airborne and flying across America. Infinite's world is amazingly atmospheric and large scaled! The beginning of the game is breathtaking, psychedelic, and amazing all at the same time! Gameplay in Infinite is familiar ground for Bioshock fans, the fundamentals are much the same; You have elements of "magic" in one hand and a classic firearm in the other. 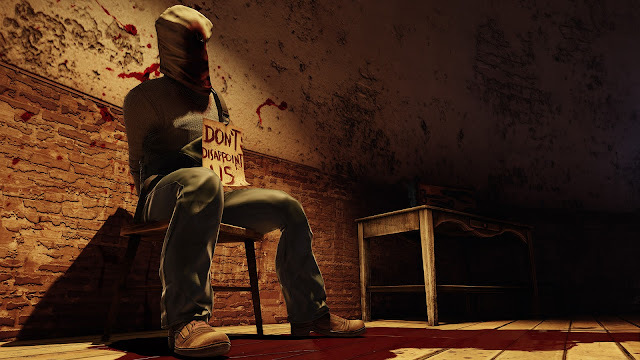 Items, money, health and ammo are found around in various objects in the environment, begging you to loot every desk, cupboard, drawer and body you come across. 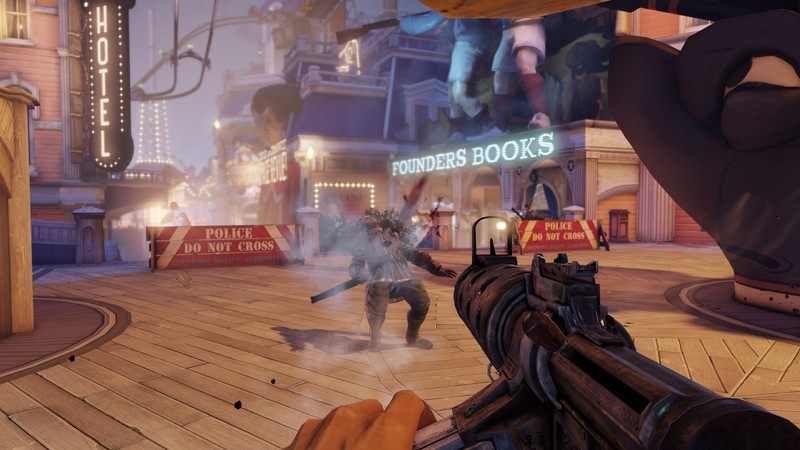 Infinite's gameplay works well in firefights, it has it's own distinctive Bioshock feeling, which sometimes feels a bit large and heavy, but is entertaining. Especially combining your Vigors (which works like magic in a traditional RPG or like the Plasmids in the previous two Bioshock games) with traditional weapons. Doing this combination makes the weapons and Vigors more powerful than simply using them separately on their own. One cannot review this game without mentioning the grapple hook and zipline system! It lets you traverse the large flying city parts easily and fast. It's really fun to jump from wire to wire speeding away and jumping down from it at the destination you desire. Killing enemies while jumping down is even more satisfying! IT kind of reminds me of the skating tracks from the first Ratchet & Clank game. Using your grapple hook to crush enemies is brutal and fun! There is plenty of action and shooting! I would have enjoyed a more advanced AI and variation in enemies though, the fights end up being a bit of a chaos, throwing Vigors and gunning around yourself in panic until everything settles. It's much like the original Bioshock, but less cramped and more open-spaced over larger distances. I never felt the true need for Vigors this time though, and they just aren't as well implemented as the plasmids in Bioshock 1 and 2. Lets talk about one of the main features in Infinite, your AI partner Elizabeth. 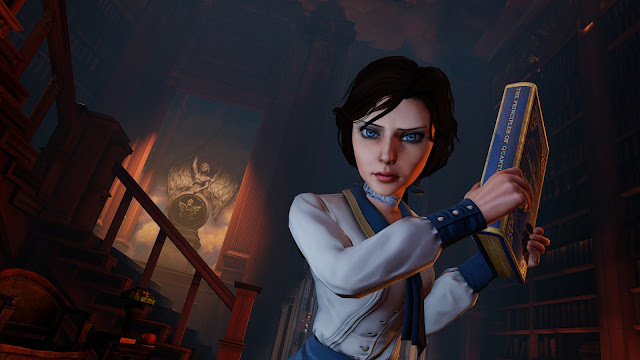 I felt the trailers released before the game launched showed a far more advanced Elizabeth behaviour. Partaking in the fighting and making rifts at her own will. The end result is a tag-along AI, which does nothing. She serves no purpose other than opening predetermined rifts which either contain; a weapon, an automated gun or a hook to grab. It's kind of disappointing compared to how she was portrayed in the trailers and how advanced the rifts looked there. Elizabeth, the person you are looking for in Infinite. Infinite is a beautiful game, much like Bioshock it's more about art direction rather than raw graphical detail. Visually it's really colourful game and almost looks like a beautiful art piece at times. I love the fact that they have dared using a so bright, colourful and daring palette (there's even a large use of pink and purple lighting). They really know how to build an imaginary and captivating world, the beginning of the game where you are baptised springs to mind; it's an incredible and very visual experience. Once again proving that Irrational Games games know how to amaze and pull players into the experience with an incredible beginning. Just like it's underwater predecessor; Infinite has an amazingly atmospheric and stunning world. Character models are fairly simple though, and especially the facial details are quite basic. I would also have liked even more small details in the environments too, with more items scattered around in Infinite's rather empty streets. There are just too few citizens, I would have loved the crowded and buzzing streets from Assassin's Creed complete with the small details in them. This is more present later on in the game; here they build a more creepy atmosphere by leaving you on your own. While this works, it's kind of sad we can't see more buzzing areas like the beginning and beach are a little later on. 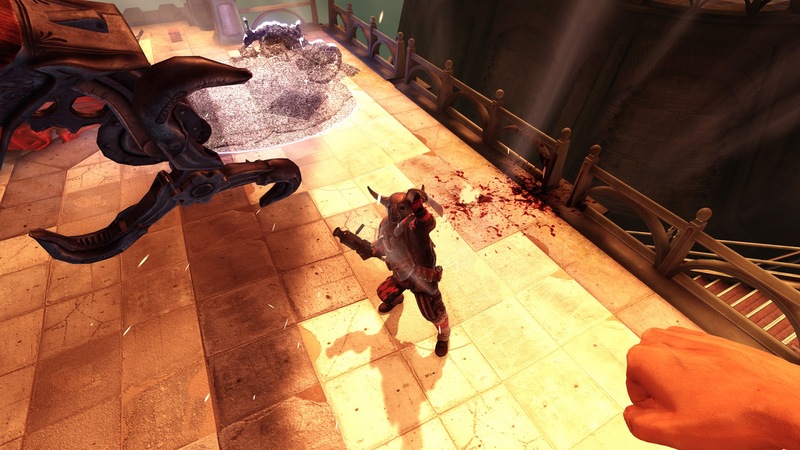 As usual the Bioshock games are gory. 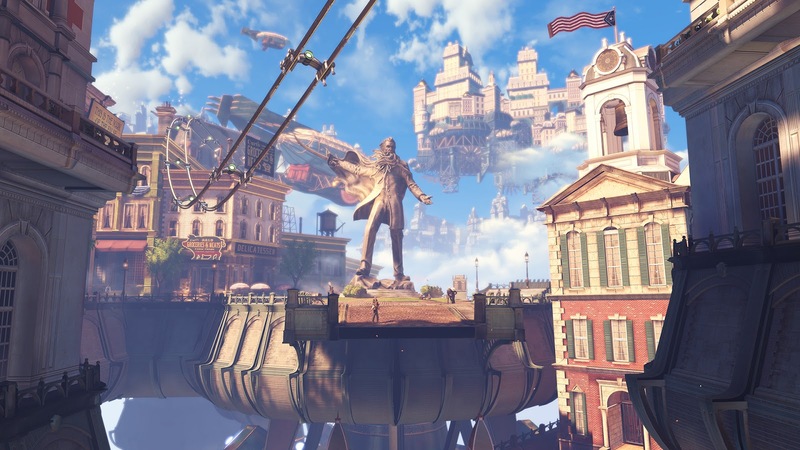 Bioshock Infinite is a game you should definitely be playing this year, without doubt. It's a pick-up essential for Bioshock fans, who will find everything very familiar and in true spirit of the series. It perhaps could have done with pushing itself further in some departments and once again I felt the ending was somewhat of a let down, not as much as BioShock, but still a rather tame conclusion in my opinion. It lacked that massive "would you kindly" plot twist which blows you completely away, but I guess they can't use the same trick again. Rest assured though; there's a very cool place you end up at the end, which will make most fans of the series smile from ear to ear! Let the Gears be the judgement of that!